Recommended for athletes, the Finessence Organic Nepalese Wintergreen Essential Oil promotes the relaxation of muscles and relieves joint pain. It has antalgic and anti-inflammatory properties. This essential oil is a natural muscle relaxant! It is used as a soothing asset in massage oils. Ideal after a physical effort, it helps relieve aches and cramps. In aromatherapy, it is also recommended to soothe rheumatism and discomfort of the joints. It also helps to reduce bruises and hematomas. Relieve your daily pains thanks to the Finessence Organic Nepalese Wintergreen Essential Oil ! In atmospheric diffusion to purify the atmosphere of your home and offer you a moment of relaxation: Add a few drops of this organic essential oil in your diffuser. Refer to your device manual for dosing and usage time. In cutaneous application: Dilute 4 drops of essential oil to 1 teaspoon of vegetable oil. Apply on painful areas by gently massaging. 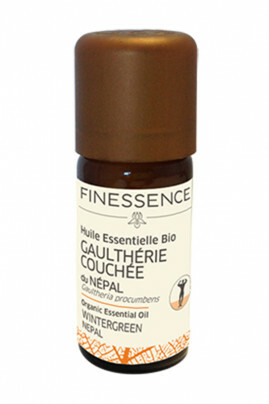 Organic Nepalese Wintergreen Essential Oil Finessence has a natural composition ! Gaultherie procubens (wintergreen) leaf oil. Harmful in case of swallowed.